Review evidence for cannabinoids as adjunctive treatments for treatment-resistant epilepsy. Systematic search of Medline, Embase and PsycINFO was conducted in October 2017. Outcomes were: 50%+ seizure reduction, complete seizure freedom; improved quality of life (QoL). Tolerability/safety were assessed by study withdrawals, adverse events (AEs) and serious adverse events (SAEs). Analyses were conducted in Stata V.15.0. 36 studies were identified: 6 randomised controlled trials (RCTs), 30 observational studies. Mean age of participants was 16.1 years (range 0.5–55 years). Cannabidiol (CBD) 20 mg/kg/day was more effective than placebo at reducing seizure frequency by 50%+(relative risk (RR) 1.74, 95% CI 1.24 to 2.43, 2 RCTs, 291 patients, low Grades of Recommendation, Assessment, Development and Evaluation (GRADE) rating). The number needed to treat for one person using CBD to experience 50%+ seizure reduction was 8 (95% CI 6 to 17). CBD was more effective than placebo at achieving complete seizure freedom (RR 6.17, 95% CI 1.50 to 25.32, 3 RCTs, 306 patients, low GRADE rating), and improving QoL (RR 1.73, 95% CI 1.33 to 2.26), however increased risk of AEs (RR 1.24, 95% CI 1.13 to 1.36) and SAEs (RR 2.55, 95% CI 1.48 to 4.38). Pooled across 17 observational studies, 48.5% (95% CI 39.0% to 58.1%) of patients reported 50%+ reductions in seizures; in 14 observational studies 8.5% (95% CI 3.8% to 14.5%) were seizure-free. Twelve observational studies reported improved QoL (55.8%, 95% CI 40.5 to 70.6); 50.6% (95% CI 31.7 to 69.4) AEs and 2.2% (95% CI 0 to 7.9) SAEs. Pharmaceutical-grade CBD as adjuvant treatment in paediatric-onset drug-resistant epilepsy may reduce seizure frequency. Existing RCT evidence is mostly in paediatric samples with rare and severe epilepsy syndromes; RCTs examining other syndromes and cannabinoids are needed. The International League Against Epilepsy (ILAE) defines epilepsy as a disease of the brain, diagnosis of which requires: (a) at least two unprovoked seizures occurring >24 hours apart; (b) one unprovoked seizure and a probability for further seizures of at least 60%, occurring over the next 10 years or (c) the diagnosis of an epilepsy syndrome.1 Between 70% and 80% of patients with new-onset epilepsy achieve complete seizure control using antiepileptic drugs such as valproate or carbamazepine.2 In 20%–30% who are drug-resistant,3 4 there is great interest in investigating novel agents to reduce seizure frequency and severity. For the purposes of this review, the ILAE’s definition of drug-resistant epilepsy—the failure of adequate trials of two tolerated and appropriately chosen and used antiepileptic drugs (AEDs) schedules (as either monotherapies or in combination) to achieve seizure freedom5—is used. For the 30% of patients who experience drug-resistant epilepsy, the efficacy of alternative and adjunctive therapies is likely to be of great interest. Recently Israel, the Netherlands, Germany and Canada have legislated to allow the use of cannabinoids for medicinal purposes. In Australia, Federal and state legislation that allows doctors to prescribe cannabinoids is being implemented. Systematic reviews are required to synthesise the evidence for individual conditions for which cannabinoids may be used to inform clinical practice and patient guidance. This review considers evidence on the safety and efficacy of cannabinoids as adjunctive treatments for drug-resistant epilepsy. As previous reviews noted a lack of controlled studies,13 14 we synthesised evidence from randomised controlled trials (RCTs) and observational studies. This review was conducted according to the Preferred Reporting Items for Systematic Review and Meta-Analysis (PRISMA) guidelines (see PRISMA checklist in online supplementary materials 1). The search strategy and data extraction process are briefly summarised here; methodology is detailed in full in the study protocol (Prospero registration number CRD42017055412; see online supplementary materials 2) Please note that there is considerable material documenting both the methods and the results of this review in the online supplementary materials, which we recommend reviewing. To identify individual studies examining cannabinoids to treat epilepsy, the electronic databases Medline, Embase and PsycINFO, and the clinical trials registries: clinicaltrials.gov, the EU clinical trials register (www.clinicaltrialsregister.eu) and the Australian and New Zealand Clinical Trials Registry (ANZCTR, www.anzctr.org.au) were searched in October 2017 using terms shown in box 1 (corresponding subject headings in each database were used where specialised thesauri existed). We additionally searched reference lists of systematic reviews identified as relevant. Searches were limited to studies published from 1980 to 9 October 2017 on human subjects, in any language. The Medline search is provided in online supplementary materials 4. Studies were included in the review if they administered plant-based and pharmaceutical cannabinoids to prevent or treat epilepsy and epileptic seizures in participants of any age, with any type of epilepsy or seizure. We included all experimental and epidemiological study designs including RCTs, non-RCTs, quasi-experimental, before and after studies, prospective and retrospective cohort studies, case-control studies, analytical cross-sectional studies, self-report surveys and case reports. Studies were excluded from the review if they were reviews of mechanisms of cannabinoid systems, commentary and review articles. 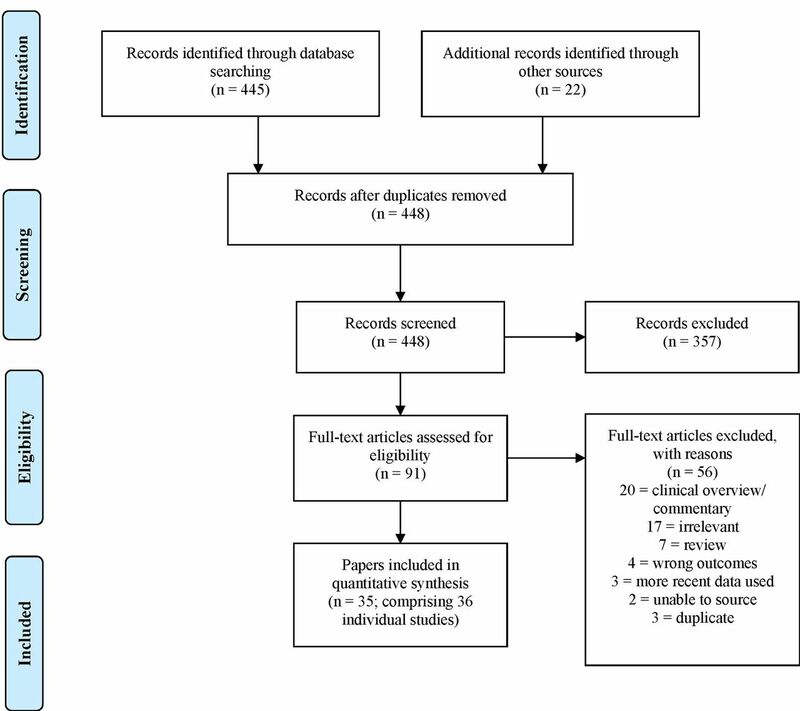 Two reviewers independently examined titles and abstracts in the web-based systematic review program, Covidence.15 Relevant articles were obtained in full, and assessed for inclusion independently by two reviewers. Inter-reviewer disagreement on inclusion was discussed with an aim to reach consensus. A third reviewer was consulted when consensus could not be reached by the two initial reviewers. We considered primary and secondary outcomes suggested by the International League Against Epilepsy’s Commission on Outcome Measurement.16 17 The primary outcome was the proportion of patients who experienced a 50% or greater reduction in seizure frequency. Secondary outcomes included the proportion of patients achieving complete seizure freedom; quality of life indicators (including changes in mood, behaviour, sleep, attention, speech and cognitive, social and motor skills); withdrawal from the study (due to adverse events (AEs) or other reasons) and AEs. Methodological quality ratings for risk of bias in RCTs were determined using the Cochrane Collaboration risk of bias tool.18 RCTs were judged to have an overall low risk of bias if they had six to eight risk domains rated as having a low risk of bias, unclear risk if four or more domains were judged as being unclear and high risk if three or more domains were judged as being high risk. Observational or case study reports were evaluated using risk of bias in non-randomised studies - of interventions (ROBINS-I) tool for assessing risk of bias in non-randomised studies of interventions.19 Overall risk of bias was determined by the most serious risk of bias allocated to that study across the tool. Any disagreements were resolved through discussion, or with the input of a third reviewer. An evidence grade was given to each reported study, based on the Grades of Recommendation, Assessment, Development and Evaluation (GRADE) tool.18 Randomised, double-blind placebo-controlled trials were considered to be of the highest quality, but ratings could be downgraded where there were instances of bias or poor design. Single case studies or self-report studies were considered to be of very low quality. We additionally conducted a GRADE assessment using GRADEPro (https://gradepro.org/) for each reported pooled estimate to evaluate the risk of bias, inconsistency, indirectness, imprecision and publication bias, resulting in an overall GRADE rating for each outcome. GRADE assessments were conducted independently by two reviewers with disagreements resolved via consensus with a third reviewer. Data were extracted from studies using a standardised data extraction tool in Microsoft Office Excel 2016. The data extracted from studies included specific details about the intervention, populations, study methods and outcomes of significance to the review question and specific objectives. Data extraction tools were piloted and reviewed by the authors before being finalised (see online supplementary materials 5 for fields extracted). During the review, clinical experts reviewed the extracted data and gave feedback on the need to define drug-resistant epilepsy, distinguishing between paediatric and adult epilepsies and distinguishing between AEs and serious adverse events (SAEs). Accordingly, we extracted whether studies identified their participants as having drug-resistant epilepsies, in line with the ILAE definition,5 namely, the failure of two or more tolerated and appropriately chosen AEDs, used either in combination or as monotherapy, to achieve complete seizure freedom (see online supplementary materials 3 for a summary of this definition). Paediatric epilepsies were defined as those occurring in persons between the ages of 0 and 18 years. We also extracted concurrent AEDs reported by the participants. All reported AEs, including SAEs and treatment-related adverse events (TSAEs) were included in the review. We extracted AEs as being ‘serious’ or ‘treatment-related’ based on authors' report. Where studies reported multiple points of follow-up data, we extracted the longest follow-up within each study. All analyses were conducted using Stata V.15.0.20 We expected high levels of heterogeneity between studies due to differences in sociodemographic and clinical profiles, thus all outcomes were analysed using DerSimonian and Laird inverse-variance random effects meta-analysis.21 For RCTs, the relative risk (RR) of participants in the treatment groups achieving study outcomes relative to participants in the comparison group were estimated using the ‘metan’ command. For observational studies with no comparison group, the proportion of participants achieving study outcomes were pooled using the prevalence command, ‘metaprop’ using the Freeman-Tukey double arcsine transformation to stabilise variances and prevent exclusion of studies where proportions approached 0 or 1.20 22 For dichotomous outcomes from RCTs, we calculated numbers needed to treat (NNT) and numbers needed to harm (NNH) and their 95% CIs. We used pooled estimates of relative effect (ie, RRs) to take into account the event rate in control groups.23 NNT was calculated for the outcomes 50% or greater reduction in seizures, complete seizure freedom and quality of life. NNH was calculated for all-cause AEs, SAEs, TSAEs and study withdrawals due to AEs. Where sufficient data were available, we conducted subgroup analyses on the basis of epilepsy type (such as Dravet or Lennox-Gastaut syndromes); sample age (paediatric vs adult or mixed aged samples) and overall risk of bias rating. Searches identified 445 articles (see figure 1). An additional 11 poster abstracts were sourced through the American Epilepsy Society conference database24 and the authors were contacted for further details. Three additional papers were published and identified through hand-search by the authors after the initial database search, and eight papers were identified via hand-searches of systematic review reference lists. After title and abstract screening, 91 articles were selected for full-text screening. Of these, 35 papers (comprising 36 individual studies) met criteria for inclusion in the review (table 1 and online supplementary materials 6, table A4; see online supplementary materials 9 for excluded studies). We additionally identified 10 ongoing studies that met inclusion criteria but for which results have not yet been published (see online supplementary materials 10). Preferred Reporting Items for Systematic Reviews and Meta-Analyses flow chart. The RCTs included a total of 555 patients (range: 12–225), all of whom had drug-resistant epilepsy. The mean age of participants, where reported, was 16.3 years (range: 2.3–49) and the mean percentage of males was approximately 48.3% (range: 26.7%–52%). Two RCTs27 28 examined Lennox-Gastaut syndrome, one26 examined Dravet syndrome and the remaining studies25 29 30 reported on ‘mixed’ epilepsy syndromes. In comparison, the non-RCT studies included 2865 patients with drug-resistant epilepsy (range: 1–976), whom had a mean age of 15 years (range: 0.5–50). The percentage of males was approximately 48.6% (range: 0%–100%). Nine of the non-RCT studies examined Dravet syndrome either primarily or as a subgroup within a larger sample,9 32 35 39 44 46 49 52 53 eight examined Lennox-Gastaut syndrome,9 32 35 41 46 49 52 53 four studies examined Doose syndrome,46 49 52 53 the remaining studies examined mixed epilepsy syndromes8 9 11 12 31–35 37 38 40 42–54 and two studies36 55 did not specify epilepsy subtype. The RCTs all studied CBD with a placebo comparator; CBD was an adjuvant treatment in all cases. The more recent studies that describe data based on participant weight26–28 reported a CBD range of 2.5–20 mg/kg/day across a mean treatment length of 14 weeks. Earlier RCTs25 29 30 reported using 100 mg of CBD administered 2–3 times per day for a treatment period between 8 and 26 weeks. Cannabinoids used in the non-RCT studies varied, but CBD was most commonly used (n=159 11 12 31–35 37 41 43 45 46 49 52); four studies examined a combined CBD:THC extract39 44 54; six examined cannabis sativa8 36 40 47 48 50; one examined dronabinol38 and the remaining studies reported various other cannabinoid formulations. Cannabinoids were used as an adjuvant therapy, with a treatment range between 10 days and 7.5 years. Table 1 and online supplementary materials 6, table A4 include the quality assessment ratings for each of the included studies (see also online supplementary materials 6, figures A1 and A2). Of the six RCTs included in the review, only one was judged to be at a low risk of bias,26 one study was judged to be high25 and the remaining four were judged to have an unclear risk of bias27–30 (see online supplementary materials 6, figures A1 and A2), primarily due to lack of detail. Non-randomised trials were mostly judged to be at serious to critical risk of bias, particularly those with self-reported outcomes on self-selected participant samples (see online supplementary materials 6, figure A3). The lack of randomisation, blinding and control groups in these studies mean that their results can at most be indicators of clinical experience rather than evidence for the effectiveness of the product used. Methodological quality for these studies was typically graded as low or very low (see online supplementary materials 6, table A4 for full description of the studies). CBD was more likely to produce >50% reduction in seizures than placebo in two RCTs (RR 1.74, 95% CI 1.24 to 2.43, n=291 patients, mean age: 25.9 years, range: 10–45 years, I2=0%; low GRADE rating; see table 2 and in online supplementary material 7.1, figure A4). We estimated that the NNT for one person to achieve a 50% reduction in seizures was 8 (95% CI 6 to 17). Estimates did not differ based on epilepsy type, sample age or study risk of bias rating (see online supplementary material 7.1, figure A5–A7). An estimated 48.5% of the 970 patients in 17 observational studies achieved a 50% or greater reduction in seizures (95% CI 39.0% to 58.1%, mean age: 8.8 years, range: 6 months to 46 years, considerable heterogeneity, I2=79.5%; low GRADE rating; see table 2, supplementary material 8.1, figure B1). This estimate is comparable to, although larger than the proportion of responders in the two larger, high-quality RCTs (42.6%26 and 44.2%28). Estimates did not differ by epilepsy type, sample age or study risk of bias (see online supplementary material 8.1, figures B2–B5). The pooled estimate for paediatric only samples (57.7%, 95% CI 39.0% to 75.6%) was somewhat higher than that for adult, or mixed adult and paediatric samples (36.2%, 95% CI 11.3% to 64.4%); however, these estimates fell within overlapping bounds of uncertainty (online supplementary material 8.1.2a, figure B4). As noted in table 4, we conclude there is mixed quality evidence that there may be some treatment effect of CBD as an adjunctive therapy in achieving 50% or greater reduction in seizures. There is insufficient evidence from moderate-quality or high-quality studies to assess whether there is a treatment effect of Cannabis sativa, CBD:THC combinations or oral cannabis extracts. Of the three RCTs that reported data on complete seizure freedom, one study involved only paediatric patients with Dravet syndrome (n=120),26 one included both paediatric and adult patients with Lennox-Gastaut syndrome (n=171)28 and one study involved only adult patients with secondary generalised epilepsy (n=15),25 all of which were classified as drug-resistant. The pooled RR from these studies for CBD in achieving complete seizure freedom compared with placebo was 6.17 (95% CI 1.50 to 25.32, total n=306 participants, mean age: 16.4 years, range: 2.3–45.1 no heterogeneity, I2=0%; low GRADE rating; see table 2 and online supplementary material 7.2, figure A8). We estimated that the NNT for one person to achieve complete seizure freedom was 171 (95% CI 155 to 339). There were no differences identified in the RR of complete seizure freedom based on epilepsy type, age group or study risk of bias (see online supplementary material 7.2, figures A9–A11); however, each subgroup only contained one study in these analyses. The pooled prevalence of participants achieving complete seizure freedom in the 14 observational studies with no comparison group was 8.5% (95% CI 3.8% to 14.5%, n=944, mean age: 8.1, range 6 months to 46 years, substantial heterogeneity, I2=77.3%; see online supplementary material 8.2, figure B6, low GRADE rating). This was higher than the proportion of participants who achieved complete seizure freedom in the two larger, high-quality RCTs (namely 4.9% and 5.8%). There were no significant differences in the proportion of participants achieving complete seizure freedom by epilepsy type, participant age or risk of bias (see online supplementary material 8.2, figures B7–B10). The pooled estimate for paediatric samples (14.3%, 95% CI 5.2% to 25.9%) was somewhat higher than that for adult or mixed adult and paediatric samples (4.3%, 95% CI 1.3% to 8.4%); however, these estimates fell within overlapping bounds of uncertainty (see online supplementary material 8.2.2a, figure B9). As noted in table 4, we conclude that there is mixed quality evidence that the use of CBD as an adjunctive treatment may help achieve seizure freedom. There is insufficient evidence to assess whether CBD:THC combinations or oral cannabis extracts are effective. Fourteen studies (comprising 26 individual data points) evaluated the effects of cannabinoids on quality of life indicators. Two were RCTs,26 28 and 12 were observational studies, of which 4 were retrospective chart reviews,51–54 4 were case study reports,35 39 41 43 2 were self-report surveys48 49 and 2 were open-label trials.12 32 Quality of life in the two RCTs26 28 was measured by parent’s/caregiver’s global impression of change. Non-RCTs reported improvements in mood, social skills, cognitive skills, behaviour, alertness/attention, speech and language, sleep, appetite and motor skills and reductions in self-stimulation. The pooled RR of parents/caregivers reporting that the patients’ overall condition had improved (using the patient global impression of change measure) in those receiving CBD versus placebo of 1.73 (95% CI 1.33 to 2.26, n=274 patients, mean age: 12.6 years, range 2.3–45.1, no heterogeneity, I2=0%; see table 2, online supplementary material 7.3, figure A12), and this did not differ on the basis of epilepsy type, sample age or study risk of bias (online supplementary material 7.3, figures A13–A15). The NNT for one person receiving CBD to experience an improvement in parental-reported quality of life was 5 (95% CI 4 to 9). A pooled estimate from observational studies of the proportion of patients with improved quality of life when using cannabinoids was 55.8% (95% CI 40.5 to 70.6, n=440 patients, mean age: 12.7 years, range: 6 months to 50 years, considerable heterogeneity, I2=93.9; see online supplementary material 8.3, figure B11). This included improvements in mood (95.9%, 95% CI 74.1 to 100), cognitive skills (76.1%, 95% CI 53.8 to 93.6), alertness (54.0%, 95% CI 28.3% to 78.9%) and sleep (50.9%, 95% CI 9.8% to 91.4%; see online supplementary figure B11). The proportion of participants reporting improvement in quality of life indicators was higher in samples with Dravet syndrome (100%, 95% CI 84.3% to 100%) compared with samples with mixed epilepsy syndromes (44.4%, 95% CI 29.6% to 59.5%); however, the studies comprising the Dravet syndrome subgroup were all case series (combined n=5 patients) in which every patient responded and thus this should be interpreted with great caution (online supplementary material 8.3.1, figure B12). Samples comprising adults only reported higher proportions of participants experiencing improved appetite, mood and sleep (89.3%, 95% CI 75.5% to 98.3%) compared with paediatric samples (30.1%, 95% CI 16.7% to 44.9%; see online supplementary material 8.3.2, figure B13). Studies rated as being at ‘serious’ risk of bias (the second highest risk rating) had lower overall proportions of participants reporting improvement in quality of life (16.6%, 95% CI 8.4% to 26.3%) compared with studies at ‘critical risk’ (the highest rating; 65.2%, 95% CI 34.5% to 91.3%) and studies where risk was unable to be determined due to lack of information (85.4%, 95% CI 67.5% to 98.0%; see online supplementary material 8.3.3, figure B14). As noted in table 4, we conclude there is mixed quality evidence that CBD improved patient quality of life when used as an adjunctive treatment. There was very low-quality and low-quality evidence on the use of Cannabis sativa, oral THC, CBD:THC combinations and oral cannabis extracts. This was insufficient to assess their therapeutic usefulness. In RCTs, there was no difference in the likelihood of study withdrawal for any reason between patients given CBD and who received placebo (pooled RR 2.96, 95% CI 0.64 to 13.78, n=306 patients; mean age: 16.4 years, range: 2.3–49, moderate heterogeneity, I2=52.2%; see table 3, online supplementary material 7.4, figure A16). This did not differ on the basis of epilepsy type, sample age or study risk of bias (see online supplementary material 7.4, figure A17–A19). Based on two RCTs,26 27 patients receiving CBD were more likely to withdraw from the study due to experiencing AEs (pooled RR 4.87; 95% CI 1.10 to 21.68, n=345, mean age: 11.9, range: 2–55 years, no heterogeneity, I2=0%; see online supplementary material 7.4.4, figure A20), with no difference based on epilepsy type, sample age or study risk of bias (see online supplementary material 7.4, figures 21–23). The NNH for one person to withdraw from CBD treatment due to AEs was 164 (95% CI 140 to 267). A pooled estimate of the proportion of participants withdrawing from the study for any reason in four11 52 53 55 non-RCTs was 28.0% (95% CI 5.2% to 59.5%, n=486, mean age: 8.7, range: 6 months to 32 years, considerable heterogeneity I2=98.0%; see table 3, online supplementary material 8.4, figure B15). All samples comprised a mix of epilepsy subtypes (see online supplementary figure B16). Pooled estimates of withdrawal were higher for paediatric-only samples (47.9%; 95% CI 40.9% to 55.0%) compared with mixed paediatric and adult samples (15.2%; 95% CI 11.3% to 19.6%; see online supplementary material 8.4.1, figure B17). One study rated as critical risk of bias (the highest risk category)53 had substantially higher proportions of participants reporting study withdrawal (70.6%, 95% CI 61.9% to 78.0%) than studies of lesser risk (see online supplementary material 8.4.2, figure B18). The pooled estimate for withdrawals from the study due to AEs in six studies11 12 41 53–55 was 4.1% (95% CI 0.9% to 8.8%, substantial heterogeneity, I2=72.3%, n=521, mean age: 10, range: 6 months to 32 years; see online supplementary material 8.4.3, figure B19), and did not differ based on epilepsy type, sample age or study risk of bias (see online supplementary material 8.4, figures B20–B22). Study withdrawals were noted for patients receiving CBD and oral cannabis extracts (table 3). There is mixed quality evidence, including from two higher-quality RCTs that patients who received CBD were more likely to withdraw from treatment. There is insufficient evidence to draw any conclusions about withdrawals from oral cannabis extract treatment. A meta-analysis of 516 patients in three RCTs26–28 found that patients who received CBD had a small but significant increase in the risk of experiencing any AE compared with those who received placebo (pooled RR 1.24, 95% CI 1.13 to 1.36, mean age: 13.7, range: 2–55 years, no heterogeneity, I2=0%; see table 3, online supplementary material 7.5, figure A24), with no difference based on epilepsy type, sample age or study risk of bias (see online supplementary material 7.5, figures A25–A27). Specific AEs for which participants receiving CBD were at increased risk included drowsiness (RR 2.53, 95% CI 1.40 to 4.57), diarrhoea (RR 2.63, 95% CI 1.45 to 4.76), fatigue (RR 5.80, 95% CI 1.36 to 24.83) and changes in appetite (RR 5.46, 95% CI 2.18 to 13.69; see online supplementary material 7.5.4, figure A28). The NNH for one person receiving CBD to experience any AE was 3 (95% CI 3 to 6). Pooled estimates of 651 patients in 12 non-RCTs were that 50.6% of patients experienced any AE (95% CI 31.7% to 69.4%, mean age: 12.6, range: 6 months to 50 years, considerable heterogeneity, I2=94.4%; see online supplementary material 8.5, figure B23). This did not differ based on epilepsy type. Mixed paediatric and adult samples had significantly higher proportions of participants reporting any AE (82.8%, 95% CI 75.6% to 89.1%) compared with adult-only and paediatric-only studies (see online supplementary material 8.5.2, figure B25), and studies at critical risk of bias (the highest risk level) had significantly smaller proportions (27.0%, 95% CI 14.2% to 41.9%) than studies at lesser risk (see online supplementary material 8.5.3, figure B26). The most common specific AEs included drowsiness (22.6%, 95% CI 15.3% to 30.7%), ataxia (17.1%, 95% CI 1.1% to 41.7%) and diarrhoea (11.3%, 95% CI 2.8% to 23.0%; see online supplementary material 8.5.4, figure B27). Three RCTs26–28 found that patients in the CBD treatment groups were more likely to experience any SAE event than patients in placebo conditions (pooled RR 2.55, 95% CI 1.48 to 4.38, n=516, mean age: 14.3, range: 2–55, no heterogeneity I2=0.4%, low GRADE rating; see online supplementary material 7.6, figure A29), with no difference based on epilepsy type, sample age or study risk of bias (see online supplementary material 7.6, figures A30–A32). Specific SAEs recorded included status epilepticus and elevated aminotransferase levels (see online supplementary material 7.6.4, figure A33) The NNH for one person using CBD to experience any SAE was calculated to be 23 (95% CI 18 to 40). Patients receiving CBD also had increased odds of experiencing TSAEs (RR 5.93, 95% CI 1.38 to 25.46, n=396, mean age: 15.8, range: 2–55 years, no heterogeneity, I2=0%, low GRADE rating; see online supplementary material 7.6.6, figure A34), with no difference based on epilepsy type, sample age or study risk of bias. The NNH for one person to experience a TSAE was 191 (95% CI 167 to 529). In the five non-RCT studies12 32 33 45 52 with 201 patients, the pooled estimate of patients experiencing any SAE were 2.2% (95% CI 0% to 7.9%, mean age: 9.1 years, range: 6 months to 31 years, moderate heterogeneity, I2=52.5%, low GRADE rating) (see online supplementary material 8.6, figure B28). The percentage of participants experiencing SAEs did not differ by epilepsy type or sample age; however, studies at critical risk of bias (the highest risk level) had lower rates of SAEs than studies at lesser risk (see online supplementary material 8.6, figure B29–B31). SAEs included pneumonia and thrombophlebitis; however, these were reported in only one study33 (see online supplementary material 8.6.4, figure B32). Only one observational study reported TSAEs,11 with 1.1% (95% CI 0.6% to 1.8%) of participants reporting this outcome (n=162, mean age: 10.5, range: 0.9 to 2.62 years, unimportant heterogeneity, I2=22.5%, very low GRADE rating). Specific TSAEs included status epilepticus, convulsion, hepatoxicity, pneumonia and death in one case (see online supplementary material 8.6.5, figure B33). There is mixed quality evidence, including from three moderate-quality to high-quality RCTs, that patients receiving CBD are more likely to experience mild-to-moderate AEs (see table 4). There is insufficient evidence to draw any conclusions on whether patients receiving Cannabis sativa, oral THC and oral cannabis extracts were more likely to experience AEs. We synthesised available evidence on the safety and efficacy of cannabinoids as an adjunctive treatment to conventional AEDs in treating drug-resistant epilepsy. In many cases, there was qualitative evidence that cannabinoids reduced seizure frequency in some patients, improved other aspects of the patients’ quality of life and were generally well tolerated with mild-to-moderate AEs. We can be much more confident about this statement in the case of children than adults, because the recent, larger, well-conducted RCTs were performed in children and adolescents. In studies where there was greater experimental control over the type and dosage of cannabinoid used, there was evidence that adjuvant use of CBD reduced the frequency of seizures, particularly in treatment-resistant children and adolescents, and that patients were more likely to achieve complete seizure freedom. There was a suggestion that the benefits of adding CBD may be greater when patients were also using clobazam.11 12 However because clobazam and CBD are both metabolised in the cytochrome P450 pathway, the pharmacokinetic interactions of these two drugs still need to be fully determined.56 Further randomised, double-blind studies with a placebo or active control are needed to strengthen this conclusion. Non-RCT evidence was consistent with RCT evidence that suggested cannabinoids may reduce the frequency of seizures. In most of these studies, cannabinoid products and dosages were less well-controlled, and outcomes were based on self-report (often by parents). These studies provide lower quality evidence compared with RCTs due to the potential for selection bias in the study populations, and other weaknesses in study design. There was also some evidence that studies at very high risk of bias had higher reported proportions of participants reporting reductions in seizures and lower proportions reporting AEs. In RCTs, and most of the non-RCTs, cannabinoids were used as an adjunctive therapy rather than as a standalone intervention, so at present there is little evidence to support any recommendation that cannabinoids can be recommended as a replacement for current standard AEDs. There are still few well-controlled, randomised and placebo-controlled studies on CBD in drug-resistant epilepsy.57 Most studies in this review were observational and used self-report data, raising concerns about possible patient selection and self-reporting bias. This concern especially applies to self-report surveys of parents, most of whom were self-selected and so may only include the most satisfied users of cannabinoids. They are unlikely to have included patients who had negative experiences or received no benefits from using cannabinoids. Small numbers of patients (8%–12%) in two RCTs experienced TSAEs.26 28 Studies are needed to assess whether the rate of these SAEs is similar to that experienced by patients receiving approved AEDs. Incidence rates of SAEs with clobazam, a common epilepsy treatment60 61 are similar to the profiles of cannabinoid SAEs. If cannabinoids are more effective when combined with clobazam,11 the possibility of increased rates of SAEs will need to be considered. Safety issues need to be highlighted when discussing the results of poorly controlled studies of cannabinoids in epilepsy. In clinical trials and non-experimental clinical studies, doctors and other healthcare professionals can monitor patients and intervene if they experience AEs. When patients use ‘artisanal’ cannabis products, there is much less control over dosages and purity of the product, and so more variability in dosing. For example, in one study, dosages of CBD reported by parents ranged from 0.5 to 28.6 mg/kg/day, and THC dosages ranged from 0 to 0.8 mg/kg/day.49 Well-controlled and well-regulated therapeutic trials are essential to specify the doses required to produce therapeutic effects with a minimum of AEs. We identified an additional 10 studies that met inclusion criteria but for which results were not yet posted. As these results become available, we hope to see these included in updated reviews13 in order to improve recommendations on the use of cannabinoids for treatment-resistant epilepsy. Few high-quality RCTs have been conducted to date, and those that currently exist have tested CBD in paediatric samples with rare and serious forms of drug-resistant epilepsy. Of these existing studies, a reasonable proportion of patients experienced a decrease in seizure frequency when using pharmaceutical grade CBD products in addition to AEDs; however, minor AEs were likely and complete seizure freedom was unlikely. The timely completion and publication of RCTs will provide a better basis for assessing the benefits and risks of cannabinoid products to control epilepsy. These results will also provide a better basis for a more rational and informed clinical use of cannabis-based products and cannabinoids to treat drug-resistant epilepsy. The authors would like to acknowledge Mary Kumvaj for her assistance with the literature searches, David Clarke for his assistance with data screening, Rakin Rahman for his assistance with data extraction and checking and John Lawson for providing comments on an earlier draft of the manuscript. Veritas Health Innovation. Covidence systematic review software. Melbourne, Australia. http://www.covidence.org.
. Cochrane handbook for systematic reviews of interventions vol 4. John Wiley & Sons US, 2011. American Epilepsy Society. Annual meeting abstract search. 2017. https://www.aesnet.org/annual_meeting/abstract_search (cited 2017 May 8). GW Pharmaceuticals. GW pharmaceuticals announces second positive phase 3 pivotal trial for Epidiolex (cannabidiol) in the treatment of lennox-gastaut syndrome. GW Pharmaceuticals, 2017. https://www.gwpharm.com/about-us/news/gw-pharmaceuticals-announces-second-positive-phase-3-pivotal-trial-epidiolex.
. Double-blind clinical study of cannabidiol as asecondary anticonvulsant, in Marijuana '90 international conference on cannabis andcannabinoids . Kolympari, Crete, 1990.
. Anticonvulsant effect of cannabidiol. S Afr Med J 1986;69:14.
. Cannabidiol treatment of refractory epileptic spasms: an open-label study. Pennsylvania, PA: American Epilepsy Society Annual Meeting, 2015.
. Cannabadiol in genetic refractive epilepsy in dravet and non-dravet cases. Philadelphia, PA: American Epilepsy Society Annual Meeting, 2015. NCT02324673 (INSYS Therapeutics Inc). Cannabidiol oral solution in pediatric participants with treatment-resistant seizure disorders. Clinicaltrials.gov, 2017.
. Complex partial seizure symptoms affected by marijuana abuse. J Clin Psychiatry 1990;51:439–40.
. On the application of cannabis in paediatrics and epileptology. Neuro Endocrinol Lett 2004;25:40–4.
. Marijuana: an effective antiepileptic treatment in partial epilepsy? A case report and review of the literature. Rev Neurol Dis 2007;4:103–6.
. Treatment with CBD in oily solutions of drug-resistant pediatric epilepsies, in Congress on Cannabis and the Cannabinoids. Leiden, The Netherlands: International Association for Cannabis as Medicine, 2005.
. Whole cannabis extract of high concentration cannabidiol may calm seizures in highly refractory pediatric epilepsies. Washington, DC: American Epilepsy Society Annual Meeting, 2013.
. Cannabis for treatment of children with severe epilepsy –promising results ; (11-13 September), Tel Aviv, Israel: The International Medical Cannabis Conference. 2016. National Academy of Sciences, E., and Medicine. The health effects of cannabis and cannabinoids: the current state of evidence and recommendations for research. Washington, DC: The National Academies Press, 2017. Contributors MW, SN and LD devised the search strategy and data extraction tool, and ES and MW ran the literature searches. ES, DZ, GC and MW screened studies for inclusion, and extracted study data. DZ and GC conducted GRADE assessments, and ES resolved conflicts. ES conducted the data analysis. ES, GC, DZ, MW, WDH and LD wrote the manuscript, and SN, GKH and MF provided substantial comments on iterations of the draft. All authors approved the final version for submission. Funding Funding was received from the Commonwealth Department of Health, the NSW Government Centre for Medicinal Cannabis Research and Innovation, the Victorian Department of Health and Human Services and the Queensland Department of Health. GC, ES, SN and LD are supported by NHMRC research fellowships (#1119992; #1104600; #1013803 and #1041472). The National Drug and Alcohol Research Centre at the University of NSW is supported by funding from the Australian Government under the Substance Misuse Prevention and Service Improvements Grant Fund. Competing interests SN, MF and LD have all been investigators on untied investigator-driven educational grants funded by Reckitt Benckiser. MF and LD have received an untied educational grant from Mundipharma for postmarketing surveillance studies of Reformulated OxyContin. SN, MF and LD have been investigators on untied investigator-driven educational grants funded by Indivior. WDH provided evidence to parliamentary committees on medical uses of cannabis in Australia and the UK, and is on the Australian Advisory Council on the Medicinal Use of Cannabis. MW, WDH, MF and LD have previously published manuscripts on the topic of therapeutic use of cannabis.